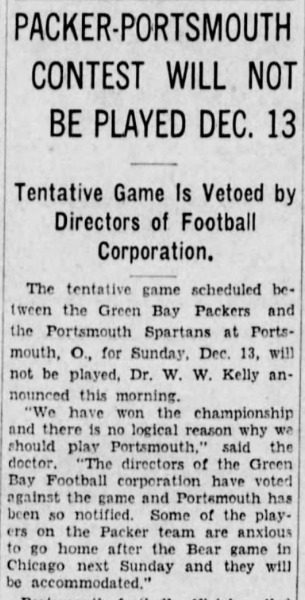 The Game Not Played, the Championship Not Won - "Tentative Game is Vetoed by Directors of Football Corporation"
In 1931, when the Packers canceled a late season game against the Spartans in Portsmouth, the Spartans hoped that if they could defeat the Packers in a season finale, they would go on to play the Packers, a second time, in a first-ever, postseason playoff game. It was not to be. Packer’s President L.H. Joaness announced: “We have won the championship and there is no logical reason why we should play Portsmouth. The directors of the Green Bay Football Corporation have voted against the game and Portsmouth has been so notified.” According to the Green Bay Press-Gazette, Joaness noted that “weather conditions might be unfavorable at game time and the crowd might be a small one and Green Bay would suffer a financial loss.” While Portsmouth fans viewed this as little more than a face-saving excuse, the finances of the Packers were nearly as bad as those of the Spartans.